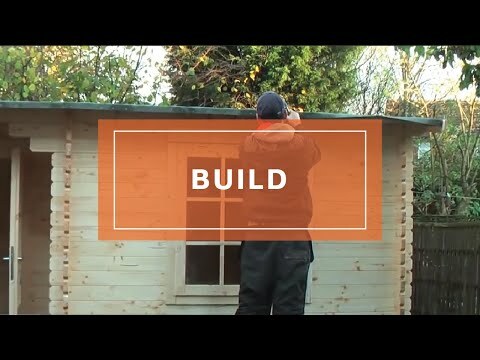 The Douglas 4.2m x 5.7m Log Cabin Garage is a free standing garage which is perfect for general storage or for high security storage of a vehicle. Our strong and sturdy building is designed with the security in mind. The buildings' full-length double doors and additional side door allows easy accessibility from either side of the building. The Baltic sourced pine utilised is dense and durable and the 44mm double tongue and groove logs interlock to offer a stable and log-lasting log cabin garage. The log cabin garage is supplied with thick 45mm x 70mm bearers that have been pressure-treated which enables them to resist moisture effectively, and 44mm joists help support the log cladding. This Log Cabin will be delivered in individual tongue and groove timberlengths and it will need to be treated with a high quality timber treatment after construction. The cabin should be constructed on alevel and firm base such as concrete slabs. Installation of an insulation kit is not included within the Waltons Insulation Service.